Click here to view a clip from this DVD. Improve the level of officiating by matching theory with practicality. Provide all participants with an appreciation of what it takes to become a "good" referee. Provide instruction for R1, R2, Line Judge, and score keeper. Provide video coverage of ball handling, rotational issues, back row attack/block and much more. Provide current Rules Changes and Points of Emphasis. Demonstrate technique changes from USAV. Provide a combination of actual play, visual images of key information and the interpretation of rules and situations. Provide a comprehensive coverage of USAV rules. This video was developed with the objective to serve as a comprehensive and consistent tool for the training of officials throughout all of USAV. 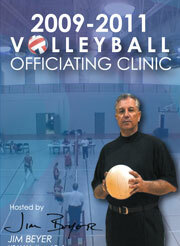 Use of this DVD provides consistency in training among all USAV officials. Jim Beyer, USAV National Referee, with Big 10, Big 12, MVC experience and Central Iowa PAVO Board Chair, is the clinician. Craig Werner, a USAV/PAVO National Referee and Referee Chair of the Iowa Region is also featured in the video. Video Length - 60 min. Immediate and custom delivery options available via phone. Copyright © 2007 J and B Production LC. This site is currently maintained by Bentzinger Consulting. Design by Andreas Viklund.